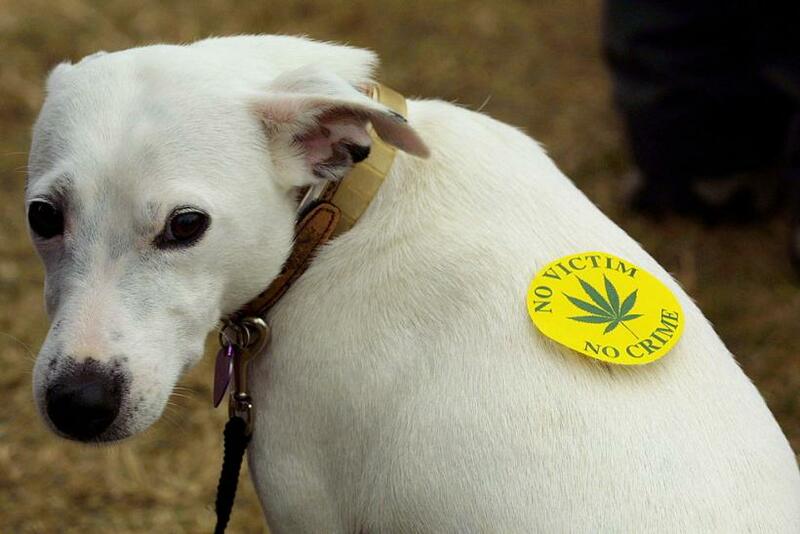 Medical marijuana may be just the remedy for dogs scared by the booms and crackles of fireworks this July 4 holiday. Bay Area pet stores are cozying up to California’s cannabinoid craze to offer pot treats for pets whose stress levels rise during Fourth of July firework shows, NBC reports. Special treats infused with the cannabis compound CBD (cannabidiol) help reduce dog’s anxiety levels amid the chaotic cacophony of fireworks. The Holistic Hound in Berkeley, Calif., has seen an uptick in dog owners purchasing pet snacks to calm their canines. And although there are similarities between the THC-laden pot products that humans consume, these dog treats contain very low – and legal – levels of the active ingredient in marijuana. CBD is just one of more than 80 active cannabinoid chemicals in marijuana, according to the National Institute on Drug Abuse. Bay Area dog owner Zugeiryd Garcia-Barrera said she’s sold on the CBD dog treats as an anxiety remedy for her dog. "I don't want him to be stressed out, especially over something as insignificant as fireworks," she told NBC. Oakland, Calif.-based company Treatibles and Denver-based Therabis are among the dozens of dog-friendly CBD products sold across the country. Bloomberg reports that the pet supplements business became a half-billion dollar industry in the past year and is expected to grow more than $150 million in the next four years. These pet pot products are primarily used on hyperactive animals or to calm them during potentially unnerving events such as thunderstorms. Although veterinarians have varying opinions on using such products, many concede there is simply a lack of academic literature on the topic. "A lot of what we're using is extrapolated data from humans, as well as just real world experience on what works," explained Dr. Gary Richter, a veterinarian who runs a “Cannabis for Pets Masterclass.” He told Bloomberg that if it works for humans it could work for dogs. San Francisco Veterinary Specialists’ Dr. Tom Hansen cautions that he has seen dogs come to the emergency room after ingesting marijuana. Although he says most pet owners have told him CBD products have been effective in soothing their animals. "We just don't know what these products are doing," he tells NBC. "There is anecdotal information, but no science behind it because it's a Schedule 1 drug. We’re not allowed to study it." Human studies have tied CBD to successful anti-seizure, anti-inflammatory and anti-anxiety effects. And experts caution that while reading labels and dosage is important, purchasing CBD online is technically a violation of federal law regardless of a state’s legal rulings on marijuana.